FASHION SHOW AT1:30PM Accommodations to be used no later than 3/10/2020. Cannot be extended. Must be present to win. 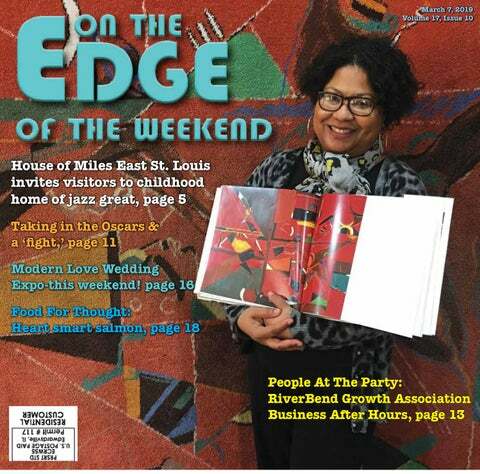 ON THE COVER: House of Miles East Saint Louis (HOME) founder and President Lauren A. Parks holds a book illustrating a Miles Davis sketch, which was made into the tapestry wall hanging that she stands in front of at the museum and educational enrichment center dedicated to Davis’ legacy of music, art and culture. HOME is based in the childhood home of Davis, who lived in the house, now renovated, from age 6 months old to age 18. THE EDGE EVENTS COORDINATOR • Kendra McAndrews ..... kendra.mcandrews@hearst.com THE EDGE CONTRIBUTORS • Vicki Bennington............... vbennington@sbcglobal.net • Keith Brake ............................keithbrake76@gmail.com • Robert Grubaugh .............. rgrubaugh19@hotmail.com On The Edge Of The Weekend is a product of Hearst Illinois Media Group. Weddings, Showers Special Events, Lodging... We Do That! Celebrate • Stay Make Elsah Your Wedding Destination! recently named the #1 Scenic Spot in Illinois. For The Edge HOME opened three years ago and has grown significantly since then, now hosting a revolving art gallery, public tours by appointment, field trips, global visitors and numerous youth enrichment programs, involving history, culture, art, music, fitness and nutrition. 327 Olive Olive Street Street •• Edw, Edw, IL IL 327 656-0845 656-0845 Steve Jackson, Jackson, Pastor Pastor Steve Sunday School: School: 9:30 9:30 a.m. a.m. Sunday Morning Worship: Worship: 10:45 10:45 a.m. a.m. Morning Wed. Early Early Morning Morning Prayer: Prayer: 5:00 5:00 a.m. a.m. Wed. Wed. Bible Bible Study: Study: 7:00 7:00 p.m. p.m. Wed. Traditional Worship: Worship: 9:00 9:00 a.m. a.m. Traditional Contemporary Worship: Worship: 10:30 10:30 a.m. a.m. Contemporary Sunday School: School: 10:30 10:30 a.m. a.m. Sunday Youth: 5:30 5:30 p.m. p.m. Youth: Dr. James James Brooks, Brooks, Lead Lead Minister Minister Dr. Rev. Jeff Jeff Wrigley, Wrigley, Assoc Assoc Minister Minister Rev. Jill Moon|The Edge HOME’s Vice President of Urban Planning Jas Gary Pearson explains the nonprofit organization’s vision for multiple phases of the site. Phase II of HOME will include renovating the house’s lower level, to be named Miles’ For The Edge Cellar, where he actually held practice for his first band, a deck, outdoor staging and a courtyard. Phase III will involve building a The HOME nonprofit acquired the Davis property in 2011. Davis’ brother, Vernon, now multi-purpose educational and entertainment deceased, was the last Davis relative that lived in the house. Renovations began in 2015, and HOME opened as a public space offering educational enrichment programming in 2016. See COOL, Page 9 facility. Whether you have a large wedding of 350 or a work conference for less than 100, we have the perfect event space to meet your needs! Celebrate your special event in style in one of our three separate unique venues. 618-604-7562 • www.faceitmu.com The Stained Glass Hall - Seats up to 175 for ceremony or 120 for seated meal. Outdoor Patio - 3,000 sq ft with fire pit and nearby pond with waterfall. The West Hall - Formerly the old Mill Room built in 1938, has over 7,000 sq ft with HVAC with arched ceiling with exposed beams and original hardwood floor. Highland Not only do we have the ideal space for your ceremony and reception, but we also offer a bridal suite with five hair and makeup stations, crystal chandeliers, a breakfast bar, and luxurious couches for relaxation. The guys will love their private suite too, complete with leather couches, TV, mini frig, pup and poker table. A UNIQUE PHOTO BOOTH EXPERIENCE! ~1963 Vintage Camper photo booth &/or backdrop options ~100% digital: All photos sent directly to your mobile device to share on social media! ~Contact us for more information! Robert Viglasky/Metro Goldwyn Mayer Pictures via AP Dwayne Johnson, left, and Vince Vaughn in a scene from “Fighting with My Family.” bra Streisand seemed convincing in her praise of both “Black KkKlansman” and Spike Lee. I liked Julia Roberts’ megawatt smile better that night than I ever have before. But the best, and I mean best, gag of the night was watching a very over-dressed Melissa McCarthy and Brian Tyree Henry present the costuming achievement award while buried in the fashions of all five nominees. McCarthy may have been a dramatic acting nominee that night, but her “bunny couture” and subtle puppeteering reminded everyone why she’s a comedy icon. and having to rely on my backup title. “Fighting with my Family” is an engaging and, at times, moving account of a young British girl’s rise from obscurity to WWE Main Roster superstardom. Executive Producer and co-star Dwayne “The Rock” Johnson brings us along for the ride, back to his roots by giving visibility to Saraya Knight (Florence Pugh) who will go on to become Diva Champion wrestler Paige (after taking her stage name from everyone’s least favorite Halliwell sister). The titular family with whom she fights are an aggressive hustling pair of entertainer parents (Nick Frost and Lena Headey) and a more talented older brother named Zak (Jack Lowden), who isn’t selected for the elite training program run by a subdued and utterly adorable Vince Vaughn. As it turns out, this is the best kind of Vince Vaughn. “Fighting with my Family” is a great family movie, especially if anyone in your family has any love of wrestling (Seamus and Big Show make cameo appearances). It’s a little cloying at times, but I highly recommend a dose of cinema like this every year to rinse the Oscar taste from one’s mouth. Prestige movies are awesome, but they’re not always real or wholesome. This one taps both of those veins. “Fighting with My Family” runs 108 minutes and is rated PG-13 for crude and sexual material, language throughout, some violence and drug content. I give this film two stars out of four. Jill Moon|The Edge HOME acquired the Davis property in 2011. Davis’ brother, Vernon, now deceased, last lived in the house. Renovations began in 2015, educational enrichment programming in 2016 and HOME opened as a public space last year. Its interior has retained as much originality as possible, from the hardwood See COOL, Page 13 floors in the four main rooms and knotty pine walls in the entryway to the wood ceiling. An abstract portrait of Miles Davis is painted on the ceiling of HOME’s rear room. East St. Louis native and graduate of the city’s high school, Mykael Ash, added several flourishes to the house through his artwork and recently had an art show at HOME’s revolving art gallery, where he sold out of his exhibited work. Miles Davis is one of the most innovative, influential and respected figures in the history of music. He is credited with changing the course of music four-to-five times and has been at the forefront of jazz for decades, setting trends and exploring musical styles from bebop through cool jazz, fusion and funk. What: Miles Tones 2019, a fundraiser for House of Miles East Saint RiverBend Growth Association Business After Hours at Old Bakery Beer Co. Louis (HOME) When: 6 to 8 p.m., Saturday, March 9 Where: Cherokee Street Gallery, 2617 Cherokee St., St. Louis Info: Miles Tones will feature a performance by musician Tonina and artwork by Kool Koor and Benjamin Lowder. Visit cherokeestreetgallery. com for more information. she retired approximately 20 years ago. Phase II of HOME will include renovating the house’s lower level, to be named Miles’ Cellar, where he actually held practice for his first band, a deck, outdoor staging and a courtyard. Phase III will involve building a multi-purpose educational and entertainment facility. “I’m so motivated by this addition to the ‘City of Champions’ — and we are! East St. Louis has numerous wonderful heroes and ‘she-roes,’ and many live here,” Lauren Parks said. “Just to have another avenue to share our culture and our history, the arts, education, is so very exciting and I’m honored to be able to do this. We thank the Miles Davis estate, who sought to donate this property to a nonprofit. We are eternally grateful to the numerous volunteers and donors who expressed their gratification for this project, as well as financial supporters.” Anyone who wishes to donate to House of Miles East Saint Louis can mail donations to P.O. Box 243, East St. Louis, Illinois, 62201. Donations can also be made online via HOME’s website. Visit houseofmilesestl.org, email houseofmilesestl@gmail.com or call 618-213-8120 for more information. Follow HOME on Facebook at HouseofMilesEastSt. Louis and Twitter @HouseOfMilesESL. Financing for Everyone Buy Here Pay Here! Low Monthly Payments. RiverBend Growth Association’s Ambassadors, left to right, Michelle Matsche (Challenge Unlimited), Jenna Andres (Scheffel Boyle) and Gary Hoggatt (1st MidAmerica Credit Union). What to discover … arts Thursday, March 7 • Chef Battle St. Louis, Willow, St. Louis, 6 - 9 p.m. • The Story Collider: Moment of Clarity, The Ready Room, St. Louis, 7 p.m. • Pinterest Night Create Your Own Bunny or Egg, Hartford Public Library, Hartford, Illinois, 6:30 - 8:30 p.m. • Pet Portrait Workshop, Courage & Grace DIY Painting Studio, Edwardsville, Illinois, 6:30 - 9:30 p.m. • Life Drawing Class Drop-In for Beginners (Adults), Drawn Studio, St. Louis, 6 p.m. • Orchid Nights, Missouri Botanical Garden, St. Louis, 6 p.m. • “Avenue Q,” Playhouse at Westport Plaza, St. Louis, 7:30 p.m., runs through March 17 • Yoga: History and Practice - Session I, SIUE Office of Educational Outreach, Edwardsville, Illinois, 5 p.m. • Yoga & Meditation - Finding a Deeper Body Alignment & Connection at A Holistic Approach, Glen Carbon, Illinois, 5 p.m. • Meal Prep Event, Southwest Diner, St. Louis, 6:30 p.m. • “La Cage aux Folles,” The Marcelle, St. Louis, 8 p.m., runs through March 23 • “Peter and the Star Catcher,” Looking Glass Playhouse, Lebanon, Illinois, 7:30 p.m., runs through March 17 Friday, March 8 • Fistful of Hollers Murder Mystery Dinner, Pere Marquette Lodge & Conference Center, Grafton, Illinois, 6:30 p.m. • Meditation & Journaling, Afterwords Books, Edwardsville, Illinois, 6:30 p.m.
• Zen Meditation, Center for Spirituality and Sustainability @ SIUE, Edwardsville, Illinois, 10 a.m. • Mindstitching 101, at A Holistic Approach, Glen Carbon, Illinois, 2 p.m. • Sips & Snuggles, Green Finned Hippy Farms Inc., Pocahontas, Illinois, 6 p.m. • Maker Days, Willoughby Heritage Farm and Conservation Reserve, Collinsville, Illinois, 10 a.m. - 12 p.m. • Meet Thomas Lennon and John Hendrix, Left Bank Books, St. Louis, 7 p.m. Saturday, March 9 • Maker Days, Willoughby Heritage Farm and Conservation Reserve, Collinsville, Illinois, 10 a.m. - 12 p.m. • Miles Tones 2019, Cherokee Street Gallery, St. Louis, 6 - 8 p.m. • Restorative Yoga Training with Cindy Kostecki, Studio Gaia, Edwardsville, Illinois, 12 - 5 p.m. • Craft Lab: Modern Calligraphy, Maypop Coffee & Garden Shop, Webster Groves, Missouri, 1 - 3 p.m. • “That’s Why She’s Dead,” Sly Hedgehog Productions LLC, Alton, Illinois, 7 p.m. • Books, Brilliance, and Brunch: A Conversation About: BECOMING, St. Louis County Library-Rock Road Branch, St. Ann, Missouri, 12:30 - 2:30 p.m. • Beyond Basics - Flooding without Borders, Toot’s Cake & Candy Supplies, Belleville, Illinois, 1 - 3 p.m. • Wreath Making Workshop, Fresh & Co. Studio, St. Louis, 11 a.m. - 1 p.m. • Ghosts of the River Road Dinner Tour, Bluff City Grill, Alton, Illinois, 6 p.m.
Sunday, March 10 • Off the Mat Series, Urban Breath Yoga, St. Louis, 4 p.m. • Ayurveda at Night, Joy of Yoga, St. Louis, 6:30 p.m. • “Won’t You Be My Neighbor?” Screening, St. Louis Jewish Community Center, St. Louis, 2 p.m. • “The Nun (La religieuse)” Film Screening, Washington University, St. Louis, 7 p.m. • Intuitive Earth: Strengthen Your Intuition Through Nature, Shanti Yoga South City, St. Louis, 2 p.m. • “Norma,” by Bellini, Winter Opera Saint Louis, Skip Viragh Center for the Arts at Chaminade College Preparatory School, St. Louis, 3 p.m. • “Two Degrees,” by Tira Palmquist and The Tesseract Theatre Company, DotZack .ZACK, St. Louis, 4 p.m., runs through March 17 • The ART of Being Human Level 1, ART International, St. Louis, 10 a.m. • Intro - Kundalini & Gong Bath - Siri Atma Kaur, South River Yoga, St. Louis, 1:30 p.m. Monday, March 11 • “2019 Workers’ Opera,” The Gaslight Theatre, St. Louis, 8 p.m. • Yoga for Runners, at RunWell, Edwardsville, Illinois, 6 p.m. • Astronomy on Tap, Urban Chestnut Grove Brewery & Bierhall, St. Louis, 7 p.m. • An Evening with Jacob Tobia and Samantha Allen, Mad Art Gallery, St. Louis, 7 p.m. • Cat Video Fest 2019, Marcus Wehrenberg O’Fallon Cinema, O’Fallon, Illinois, 7 p.m. • Ask an Entertainment Lawyer, KDHX, St. Louis, 6:30 - 8:30 p.m. • 2019 Fly Fishing Film Tour, Landmark’s Tivoli Theatre, St. Louis, 7 p.m.
• The Lab, The Improv Shop, St. Louis, 8 p.m. • Adult Tap, Jacoby Arts Center, Alton, Illinois, 3:15 p.m. Tuesday, March 12 • Color For A Cause with the Treehouse Wildlife Center, Alton Square Mall, Alton, Illinois, 5 - 7 p.m. • “Beautiful – The Carole King Musical,” The Fabulous Fox, St. Louis, 7 p.m., runs through March 17 • Red Ribbon Drag Bingo for Doorways, Hamburger Mary’s, St Louis, 6 p.m. • Dine and Donate for Walking with Wells - Strength Hope & Love, Peel Wood Fired Pizza, Edwardsville, Illinois, 11 a.m. - 10 p.m. • Sushi Rolling Experience, Tani Sushi Bistro, Clayton, Missouri, 6:30 p.m. • Piano for Beginners, SIUE Office of Educational Outreach, Edwardsville, Illinois, 6 p.m. • Wine Tasting & Hors d’oeuvres, DiGregorio’s Italian Market, St. Louis, 5:30 p.m. • Pointe, Jacoby Arts Center, Alton, Illinois, 6:40 p.m. Wednesday, March 13 • “Something Rotten,” Stifel Theatre, St. Louis, 7:30 p.m. • Cake Decorating for Beginners, Glazy Squares, Edwardsville, Illinois, 6:30 p.m. • Irish Beer Workshop, 909 Public House, Wentzville, Missouri, 7 p.m. • Family Night with Fredbird, Cardinals Nation, St. Louis, 5 - 9 p.m. • Yarn Class with Christy, Afterwords Books, Edwardsville, Illinois, 6 - 8 p.m. • Repair, Remake, Recycle - March Mending Madness, City Sewing Room, St. Louis, 6 - 8 p.m. • MineCraft Art with Mz Jane, The Underground Dojo, Collinsville, Illinois, 2 - 4 p.m.
talented wedding photographers, videographers and DJs, they provide expert photos, high-quality video, timeless music and unforgettable events at different price points. “There’s room for all budgets. We are a one-stop shop for all event media needs. You can use just one, two or all that we offer,” Sims said. “Whatever you need, we can help you.” Sims has 35 years of experience in event media planning, starting part time as an emcee and deejay for the Complete Weddings and Events franchise headquarters while attending the University of Nebraska. “Back in college, I thought about what I wanted to do when I grew up,” he recalled. “After graduation, I bought a franchise of Illinois and Missouri. I love this to this day. putting more of their budgets into photos and video. Complete Weddings and Events are not wedding coordinators, but the professionalism and knowledge of its staff helps couples coordinate, particularly during receptions. “We help move things along so the first dance isn’t at 9 p.m., for instance during a reception that’s from 7 to 11 p.m.,” he explained. “We help our brides’ dreams come true, try to help them to coordinate and give them suggestions on media.” With same-day editing, videographers can take raw footage, edit it on a laptop and show video on a 10-foot screen right before dinner is served. receives the highest customer evaluations in the whole franchise and numerous awards overall. “We’re very proud of that,” Sims said. Complete Weddings and Events, located at 11100 Olive Blvd., in St. Louis, coordinates events in all of Illinois and eastern St. Louis. “Glam is trending, big time. We are doing a lot of uplighting and backdrops,” Sims noted about recent events. And, Complete Weddings and Events has the know-how and equipment to create singular, spectacular uplighting and backdrops with 40 sets of between its headquarters in St. Louis and an office in Central Illinois. For its photo booths, either fish-eye or traditional, the company supplies props. It also supplies inflatables and has, of course, a disco ball, as Sims confirmed, “never goes out of style.” “We love the people with whom we work in Illinois. They really rock us,” noted Sims, giving shout outs to Edwardsville, Effingham, Breese, Staunton, Jerseyville and Aviston; Complete Weddings and Events also has worked on events in Illinois’ wineries and wine country. Complete Weddings and Events provides services for all occasions, including corporate events, schools, save the dates and engagement parties. Complete Weddings and Events’ business hours during which it schedules consultations and appointments are 8 a.m. to 9 p.m.
For The Edge Glamorous uplighting, designs shown here by Complete Weddings and Events, is a major trend in wedding reception decor. Complete Weddings and Events, specializing in off-site wedding events, such as at Our Lady of the Snows or Forest Park, is a leading provider of event and wedding photography, shown here, videography, lighting, DJ services and photo booth rental. By Jill Moon ALTON — Savvi Formalwear at Alton Square Mall is more than part of a cooperative of the finest formal wear retailers in the world — it’s a singular destination for its service and staff. St. Louis’ Ann Rafferty, who also owns The Ultimate Bride in her hometown, owns 10 Savvi Formalwear locations, including Alton. The store’s manager, Amy Klaus, has led the tuxedo specialty retailer for 25 years; she’s also the district manager. Savvi Formalwear also has the distinction as the only company that offers free groom’s “try-ons.” The retailer lets the groom pick out two tuxedo styles at a time, then a staff member will take the groom’s measurements and order those styles in his size. A few things make Alton’s Savvi Formalwear special. It owns all of its tuxedos, which means if you walked in one day and immediately needed to rent a tux, that you could have it the next day. Of course, Kraus recommends registering at least nine months to a year before a wedding date for the grooms’ and groomsmen’s tuxes. Measurements are needed six weeks before the event. Savvi also rents tuxedos for proms and other special occasions. The Savvi organization is collectively managed so that customers are seamlessly served across the United States and Canada. Rafferty serves on Savvi’s board of directors. To ensure the very best service for every customer, all locations are family owned and operated by members in their respective communities. And all locations are served by local warehouses so that tuxedos look their best when they are worn at an event. Savvi Formalwear’s franchise cooperative model allows it to realize large company benefits regarding such things as buying power, resource pooling and national branding, while simultaneously provides the exacting levels of customer service only possible with localized, entrepreneurial ownership. It is this combination of corporate-level management and innovation, combined with the passion and commitment of its store owners, that makes shopping at Savvi a singular and satisfying experience. Alton’s Savvi Formalwear hours are from 10 a.m. to 9 p.m. Monday through Saturday and from 12 to 6 p.m. Sunday. Visit savviformalwear.com or call the Alton store at 618-465-1110 for more information. Reach Jill Moon at 618-208-6448 and Twitter @jill_ moon. jill.moon@hearst.com BELLEVILLE — A father and son’s discovery of their shared serious passion started off in the most humorous ways. Grimm & Gorly Flowers & Gifts’ patriarch Jeff Bair, of Belleville, Illinois, worked retail for years, never having a thought about floral design until one day he had to think about it. As an area manager for Dillard’s, a day came upon him when he had to think about what he was going to do with cases upon cases of fresh flowers for Eternity’s 1980s’ fragrance launch at one of the department store chain’s locations. “My boss was gone to open a store in Omaha and I had all these fresh flowers,” Bair recalled recently to The Edge. “I asked him what I should do and he said, ‘Do the best you can, enjoy and have fun!’ He comes back for the big launch and I thought, ‘Hey, I like this, I want to do this.’” That set Bair on a path that brought him to where he — and eventually his son, Zach Bair — is today. Jeff Bair began freelancing as a floral designer, providing bouquets and design for hundreds of weddings since the Eternity launch over the next 30 years. Grimm & Gorly provides complementary wedding consultations but requests to schedule by appointment. “We love doing weddings and want to give the time you deserve,” Bair said. “We don’t want anyone to ever feel like they’re pushed or rushed. “It’s not the amount of weddings we do, it’s about customer service and integrity that we put into the weddings that we do, the service and willingness to work with people,” he continued. “We’re trying to create floral designs that will last all day and longer. If we are allowed to do the best that we can do, it’s nature’s architecture. What you see is what you get with nature.” On one occasion, when Zach, 31, was 9 years old, the elder Bair had a wedding for which to provide his services at the Missouri Botanical Garden and took his son with him. The Christian/Jewish union incorporated a chuppah (pronounced HOOP-ah), which is a canopy under which a couple stand during their wedding ceremony, but the wind kept picking up that day, and the chuppah’s chances of staying put weren’t looking good. The Grimm & Gorly name, though, is more than 100 years old. It started with the opening of Grimm & Gorly Florist on the Missouri side of the river by brothers Frank and Vincent Gorly and their cousin, who already owned the famous Belleville furniture store Hebrung and Grimm. For more information about the event: Contact Hearst Illinois Media Event Manager Kendra McAndrews at kendra.mcandrews@hearst.com or call 618-604-1361 for vendor applications. 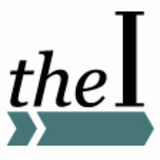 Visit thetelegraph.com and/or theintelligencer.com or email or call McAndrews for more information. shop at the city’s 11th and State streets. The Gorly brothers’ sister, Josephine Gorly Stolle, managed the East St. Louis store, but after a few years, she gave the shop over to her daughter, Melba Stolle Klapp, of Belleville. Klapp was a friend of Reis, who managed a popular Belleville restaurant, Dutch Girl, later known as the historic Fischer’s Restaurant (closed in 2017). One evening, in 1955, while Klapp was dining at Dutch Girl, she asked her good friend if he would like to buy her flower shop, and he gladly took her up on the offer. He did so well with the East St. Louis shop that he opened a second floral business in Downtown Belleville. That shop became so popular that he closed the East St. Louis location and moved the Belleville shop to a larger location on East Main and Charles streets. Forty-five years later, Reis retired, selling his flower shop to Jeff Bair, who has carried on the tradition of artistic, beautiful floral arrangements and impeccable service that has made Grimm & Gorly a household name for more than a century. Four years ago, Jeff and Zach Bair added Pour @ 322 Coffeehouse adjacent to Grimm & Gorly, a destination for regulars and visitors to get their favorite coffee drink and hang out or take it to go. Jeff’s youngest son, Christian, 17, is a Pour barista. Pour also has an irresistible selection of baked goods, made in-house; ice cream dots; and, chocolate. “We want you to walk into Pour and feel like it’s a destination,” Bair said. “Pour has a conference room available for rent and the coffee shop can be used for private events, after regular business hour. We can accommodate up to 70 people and held a party for an 11 year old, as well as a party for an 80 year old. The staff does everything from setting up tables, providing linens and cleaning up after the party.” In January of 2011, the Bairs had the opportunity to purchase Troy, Illinois’ Rita Marie’s that, with the purchase, became Grimm & Gorly Too, at 203 Edwardsville Road. The Troy shop’s hours are 9 a.m. to 5 p.m. Monday through Friday and 9 a.m. to 12 p.m. Saturday. “Between two stores, we do a lot of weddings and our staff can handle it,” Jeff Bair said. Although this household name has expanded its territory and developed many new trades within its walls, the Grimm & Gorly name has only grown better to serve a wider population and capture the original essence that is Grimm & Gorly Flowers & Gifts. Belleville’s Grimm & Gorly’s hours are 8:30 a.m. to 5:30 p.m. Monday through Friday and 8 a.m. to 4 p.m. Saturday. Pour’s hours are 7 a.m. to 7 p.m. Monday through Friday and 7 a.m. to 4 p.m. Saturday. Visit grimmandgorly.com or call 618234-4455 for more information. Still looking for meals that can make happy campers out of the healthy eating versions of my husband and I, we came upon a recipe for salmon in a magazine that our daughter bought for us, brimming full of “heart smart” dishes. I love recipe books, and magazines, too, but I don’t always carry through to actually making the recipes inside. I like looking at the photos, and sort of daydreaming how I will do them, but don’t always follow through. First, I look at the photos. Yes, that looks pretty and yummy. Then I look at the ingredients list. OK, the salmon salad recipe is a little long, but if you read closely, a lot of the items are staples that you already have in your kitchen. I’ve made it this far, so might as well keep reading. It didn’t seem too complicated, so I gave it a try. I think I have shared before that I am not a complicated cook. I’m a simple cook. If it gets too intricate, takes too long or necessitates a grocery list a mile long, I’m not doing it. salmon fillets, 1-inch thick 4 cups fresh raspberries 3 tablespoons red wine vinegar 1 tablespoon sugar 1 teaspoon Dijon mustard 1/2 teaspoon lemon zest 1/4 teaspoon salt 1/4 teaspoon black pepper 6 cups fresh baby spinach 1/4 cup crumbled reduced-fat feta cheese 3 tablespoons chopped toasted walnuts Thaw salmon, if frozen. For vinaigrette, in a small pan, combine two cups of raspberries, the vinegar, sugar and mustard. Bring to a boil, reduce heat and simmer uncovered for eight to 10 minutes or until berries have broken down and mixture is slightly thick. Cook slightly. Press through a fine-mesh sieve, discard seed. Stir in lemon zest and 1/8 teaspoon each of salt and pepper. Cool completely. If desired, it can be thinned with a little water. Lightly coat fish with cooking spray and sprinkle with remaining salt and pepper. Grease grill rack. Grill salmon covered over medium for eight to 12 minutes or until salmon flakes, turning once. In large bowl, combine spinach and vinaigrette. Toss to coat. Divide mixture among plates. Top with salmon, remaining raspberries, cheese and walnuts. Calories: 288 Fat: 10 g. Carbs: 21 Protein: 30 g.
• Open Mic Night, Germania Brew Haus, Alton, Illinois, 7:30 p.m. • Andrew McMahon in the Wilderness, The Pageant, St. Louis, 7 p.m. • Steve Cline, Prairie Inn, Dorsey, Illinois, 6 p.m. • Arkells, Delmar Hall, St. Louis, 8 p.m. • DJ Matt, The Back Bar, Edwardsville, Illinois, 9 p.m. • I See Stars, Fubar, St. Louis, 7 p.m. • Paul Niehaus IV and Nick Pence, Evangeline’s Bistro & Music House, St. Louis, 7 p.m. • HotBox, Stagger Inn Again, Edwardsville, Illinois, 10 p.m. • The Lil Smokies, Old Rock House, St. Louis, 7 p.m. • Marilyn Maye - It’s Better With A Big Band, Jazz St. Louis, St. Louis, 7:30 p.m. • Mike and the Moonpies, Off Broadway Music Venue, St Louis, 8 p.m. • Tracer, The Dark Room, St. Louis, 7:30 p.m.
Bridget Regan and Dave King of Flogging Molly perform. The group will be at The Pageant in St. Louis on Sunday. nois, 8 p.m.
What to do … events Friday, March 8 • Builders St. Louis Home & Garden Show, America’s Center, St. Louis, 10 a.m. - 8 p.m. • Rock & Roll Bingo, Collinsville VFW, Collinsville, Illinois, 6 p.m. • Pauly Shore, Funny Bone, St Louis, 7:30 p.m. • Garrison Duty - Co. A 9th IllinoisL. Vol. Inf., Camp DuBois, Wood River, Illinois, 5 p.m., runs through March 9 • Fireplace Friday, Grafton Winery The Vineyards, Grafton, Illinois, 6 p.m. • Disney’s “DCappella,” Stifel Theatre, St. Louis, 7 p.m. • State Farm MVC Men’s Basketball Championship, Enterprise Center, St. Louis, 6 p.m. • Ladies Night Out, The Weeping Willow, Bethalto, Illinois, 6 - 9 p.m. • Movie Night @ Pop Co., Kirkwood, Missouri, 5:30 - 8 p.m. • Caritas Family Solutions’ Trivia Night, Julia’s Banquet Center, East Alton, Illinois, 6 p.m.
Lloyd Bishop | NBC via Getty Images Comedian Ben Kronberg performs. • Builders St. Louis Home & Garden Show, America’s Center, St. Louis, 10 a.m. - 8 p.m. • Pauly Shore, Funny Bone, St Louis, 7:30 p.m.
Transformative Healthcare, LLC Internal Medicine Care with Lifestyle Intervention & Emotional Support to improve overall well-being. • Healthy Pets, Happy Pets by Purina Microchip & Vaccine Clinic, Metro East Humane Society, Edwardsville, Illinois, 9 a.m. - 12 p.m. • Music Trivia Night, Columbus Plaza Banquet & Meeting Center, Collinsville, Illinois, 7 p.m. • Spring Training Watch Party, Cardinals Nation, St. Louis, 11 a.m. - 4 p.m. • 10th Annual Wash & Wag, Four Muddy Paws, Edwardsville, Illinois, 10 a.m. - 3 p.m. • Group Hike, Rockwoods Reservation, Wildwood, Missouri, 10 a.m. • Trivia Night – YAC, Alton Wood River Sportsmen’s Club, Godfrey, Illinois, 6 p.m. • Fight Hard MMA, Chaifetz Arena, St. Louis, 7 p.m. • Ben Kronberg, The Monocle, St. Louis, 10 p.m. • Rampage Championship Wrestling presents Turmoil at the Temple, Franklin Lodge No. 25 AF&AM, Alton, Illinois, 4:30 p.m. • State Farm MVC Men’s Basketball Championship, Enterprise Center, St. Louis, 2:30 p.m. • Slipping into Darkness, 4 Hands Brewing Company, St. Louis, 12 - 4 p.m. • Saint Louis FC vs. Indy Eleven, Toyota Stadium, Fenton, Missouri, 1 p.m.
Sunday, March 10 • Modern Love Wedding Expo: An All Inclusive Wedding Event, SIUE’s Meridian Ballroom, Edwardsville, Illinois, 11 a.m. - 2 p.m. • Scallops Festival, Grafton Oyster Bar, Grafton, Illinois, All Day • Builders St. Louis Home & Garden Show, America’s Center, St. Louis, 10 a.m. - 5 p.m. • Stridin’ & Survivin’ Spring Vendor Fair, Knights of Columbus, Edwardsville, 1-5 p.m. • What’s the Tea? : An Exclusive Tea Tasting + Adult Coloring Experience, Teatopia, St. Louis, 12:30 - 2:30 p.m. • State Farm MVC Men’s Basketball Championship, Enterprise Center, St. Louis, 1 p.m. • Game of Thrones Themed Brunch, La Patisserie, Florissant, Missouri, 12:30 - 1:30 p.m. • Marcy Heepke Cabin Fever Horsemanship Clinic, Triangle H Farm, Edwardsville, Illinois, 1 - 4 p.m. • Adult Swim Trivia Night, Fubar, St. Louis, 6:30 p.m. • Cameras and Cocktails, Erin Dorsey Photography, Edwardsville, Illinois, 1:30 - 4 p.m. • Women of War, Soldiers Memorial Military Museum, St. Louis, 2 - 3 p.m. HEAR Continued from Page 19 • Amped up, Doc Holliday’s, Cottage Hills, Illinois, 9 p.m. • Jake’s Leg, The Wildey Theatre, Edwardsville, Illinois, 8 p.m. • Bonnie X Clyde, RYSE Nightclub, St. Charles, Missouri, 9 p.m. • Crankdat, The Crown Room, St. Louis, 9 p.m. • Living Loud, Time Out Sports Bar, Troy, Illinois, 8:30 p.m. • Voodoo CCR - Customer Appreciation Concert, The Old Bakery Beer Company, Alton, Illinois, 7 p.m. • The Liston Brothers, Delmar Hall, St. Louis, 8 p.m. • Crucifix & Hard Target - DirtBagz Tour, The Ready Room, St. Louis, 7 p.m.
Pageant, St. Louis, 7:30 p.m. • Joe Hill Road Show, The Gaslight Theater, St. Louis, 3 p.m. • St. Louis Gateway Tango Presents: La Juan D’Arienzo Orchestra, Masonic Temple, Webster Groves, Missouri, 7 p.m. • Tyler Hilton, The Ready Room, St. Louis, 7 p.m. • Punk Ska Riot Night, Blueberry Hill Duck Room, University City, Missouri, 8 p.m. • The Earls of Leicester, Sheldon Concert Hall and Art Galleries, St. Louis, 7:30 p.m. • Jason Cooper Trio, The Back Bar, Edwardsville, Illinois, 4 p.m. • Soulful Sunday with Gene Dobbs Bradford Blues Experience, National Blues Museum, St. Louis, 4 p.m. • Vandoliers with Austin Lucas, Off Broadway Music Venue, St. Louis, 7:30 p.m. • Grandson: No Apologies Tour, The Firebird, St. Louis, 8 p.m. • Nobigdyl, Old Rock House, St. Louis, 7:30 p.m. • Old Herald 2nd Sunday Acoustic Jam, Old Herald Brewery and Distillery, Collinsville, Illinois, 3 p.m.
tured Planet, City Museum, St. Louis, 7 p.m. • Rapture presents Cyanotic, Absynthe of Faith & Charles Levi, The Crack Fox, St. Louis, 9 p.m. • Guys on A Bus, Firebird, St. Louis, 7 p.m. • Young Cats of Jazz with Keith Bowman Quartet, The Dark Room, St. Louis, 7 p.m. • Music Mondays on Soulard, Four Strings, St. Louis, 6 p.m. • Wicca Phase Springs Eternal, Fubar, St. Louis, 8 p.m. Signing, Music Record Shop, St. Louis, 1 p.m. • Max Frost, Off Broadway Music Venue, St. Louis, 8 p.m. • Citizen Cope, The Pageant, St. Louis, 8 p.m.
Wednesday, March 13 • Ian Moore, The Ready Room, St. Louis, 8 p.m. • Dead Rider, FOAM, St. Louis, 7 p.m. • Catfish and the Bottlemen, The Pageant, St. Louis, 8 p.m. • J.R. Richards- Original Voice of Dishwalla, Fubar, St. Louis, 7 p.m. • The Kasimu-tet, The Dark Room, St. Louis, 9 p.m. • Voodoo Paul Simon, Broadway Oyster Bar, St. Louis, 9:30 p.m. • The Wee Heavies, Sheldon Concert Hall and Art Galleries, St. Louis, 10 a.m. • The Chloe Feoranzo Quartet, Focal Point Concerts, Maplewood, Missouri, 7:30 p.m.
Beautiful, durable floors for less. did it," said Gerard Choucroun, executive director of The Heart and Armor Foundation. The foundation also has a goal of bringing the military and veteran communities closer together with outreach, events and conversation. An event will be held Friday night called "How War Changes Women, How Women Change War" that will stream live at Facebook.com/JohnMayer and Facebook.com/HeartAndArmor at 7 p.m. Eastern. "We think that there's something in here for everybody. This is not a quick black-andwhite conversation. This is a very nuanced conversation. There's a lot of an American identity going on in our relationship to vets. It's a relationship between the citizenry and the people who absorb and commit violence for that citizenry is such a rich, cultural ground dating back to the ancient Greeks that for us now, we want to be a part of that conversation. It goes much deeper than this set of wars that we're in now," Choucroun said. Owen Sweeney/Invision/AP John Mayer performs in concert during his "The Search for Everything Tour" in Philadelphia. Associated Press Doctors at Johns Hopkins University hope to raise awareness and funds for research following famed guitarist Peter Frampton's announcement that he has a rare muscular disease. Frampton's physician, Lisa ChristopherStine, is the director of the Johns Hopkins Myositis Center. She tells The Baltimore Sun that she and Frampton spoke years ago about potentially becoming a voice for inclusion body myositis. Because the disease is rare, it's difficult to generate funding. The disease causes weakness in the legs, forearms and fingers. Its cause is still unknown. As it will eventually prevent Frampton from playing guitar, the 68-year-old is embarking on a farewell tour this summer. He's also launched a fund at Hopkins to which he'll donate $1 per ticket sold. Hopkins is also participating in two clinical trials for possible treatments. FLINT, Mich. (AP) — Jaden Smith's foundation and a church are working to bring cleaner water to Flint, Michigan. The rapper's organization and First Trinity Missionary Baptist Church on Friday announced they'll deploy a mobile water filtration system known as "The Water Box" that reduces lead and other potential contaminants. The 20-year-old's JUST goods company collaborated with the church to design and engineer the system. He is the son of Will and Jada Pinkett Smith. The church has distributed over 5 million bottles of water to residents, but bottled water Andy Kropa | Invision (AP) donations are on the decline. Flint has been replacing water lines Doctors at Johns Hopkins University hope to raise awareness and funds for research following after lead-tainted water was discovered in Peter Frampton’s announcement that he has a rare muscular disease. The disease causes 2014. Lead began leaching from pipes after weakness in the legs, forearms and fingers, and its cause is still unknown. As it will eventually the city tapped the Flint River for drinking prevent Frampton from playing guitar, the 68-year-old is embarking on a farewell tour this water without properly treating it to reduce corrosion. summer. Ernstheating.com 618-887-6522 Hamel, IL Energy & Comfort Consultants Offer expires 11/23/2018. *Rebate requires purchase of qualifying itemsitems and submission of aand complete rebateofform (with proofrebate of purchase) to www.lennoxconsumerrebates.com. Rebate is paid in the form ofno a Lennox Vist® prepaid debit card. to of terms and conditions found debit or refrenced on card and expires 12 months after issuance. applyon seecard www.lennox.com formonths completerebtae terms and conditionsRequires of *Rebate requires purchase of qualifying by 11/23/18 submission a completed form (with proof of purchase) to www.lennoxconsumerrebates.com later than 12/14/18. Rebate is Card paid isinsubject the form a Lennox Visa® prepaid card. Card is subject to terms and conditions foundConditions or referenced and expires 12 after issuance. Conditions apply. Seepurchase www.lennox. quaalifying system. Financing available well-qualified buyers on approved No down paymentpurchase required. of 0%qualifying APR for 60system. months,Financing with equalavailable monthly payments. Normal buyers late charges apply. Cannot beNo combined with anyrequired. other promotional offer. loan amount $1,000. payments. Maximum loan amount ay prepay at any without penalty. Fincancing is subject to credit requirements and satisfactory com for complete rebate terms andtoconditions. **Offer available 9/3/18credit. – 11/23/18. Requires to well-qualified on approved credit. down payment 0% APR for 60Minimum months, with equal monthly Normal late$45,000. chargesYou apply. Cannotyour be account combined withtimes any other promotional offer. Minimum loan amount $1,000. Maximum completion of finance documents. finance advertised estimates See Truth in Lending disclosure available from lender forsatisfactory more information. ***Seeof dealer for details. loan amount $45,000. You mayAny prepay yourterms account at anyare time withoutonly. penalty. Financing is subject to credit requirements and completion finance documents. Any finance terms advertised are estimates only. See Truth in Lending disclosures available from lender for more information. ***See dealer for details. ©© 2018 Lennox Industries Inc. Lennox Dealers are independently owned and operated businesses. 2018 Lennox Industries Inc. Lennox Dealers are independently owned and operated businesses. and enter to win an iPad! • Licensed! Free Estimates! • Senior Discounts! • 20 Years Experience! • Workman’s Comp & Liability Insurance! • Bucket Truck! • Stump Removal! We do it all for less! We are the best! We will beat anyone’s prices! According to a survey published by The Knot, in which it polled nearly 13,000 brides and grooms in 2016, the national average cost of a wedding is more than $35,000. Planning the ultimate wedding experience can be exhilarating, but the numbers can be overwhelming. Wedding loans can relieve some of that feeling. •$100 Off 3 or More Rooms •$100 Off Deck & Fence Staining •Huge Discounts on Exterior Painting •$50 off Power Washing •$300 Off Pole Barns We Paint, Stain, & Power Wash Houses, Mobile Homes, Fences, Decks, Garage, Pole Barns, Everything! ROB'S ROOFING All types of Roofing/Repairs. For quick reliable service. Free Estimates Licensed, Insured & Bonded. Classifieds Landscaping A landscaping company you have trusted for 38 years. 19-0154E COLLINSVILLE COMMUNITY UNIT SCHOOL DISTRICT NO. 10 NOTICE OF ELECTION NOTICE IS HEREBY GIVEN that at the Consolidated Election to be held on Tuesday, April 2, 2019, the following proposition will be submitted to the legal voters of Collinsville Unit 10 School District in Madison /St. Clair County: Shall the maximum tax rate for the tax which Collinsville Community Unit School District No. 10, Madison County, Illinois, levies for transportation purposes, be increased by 0.30 percent, from the currently authorized rate of 0.20 percent to a rate not to exceed 0.50 percent upon the value of taxable property within the District as equalized or assessed by the Department of Revenue, as authorized by Article 17 of the School Code? 1. The approximate amount of taxes extendible for transportation purposes under the maximum rate currently in force is $1,464,692, and the approximate amount of taxes extendible if the proposition is approved is $3,661,730. The polls at the election will open at 6:00 o’clock A.M. and will remain open until 7:00 o’clock P.M. of that day. Don’s Handyman Repair-Remodeling No Job Too Small! All work guaranteed! 618-606-7091 JUNK CAR BOUGHT! HIGHEST PRICES PAID! 2. The most recently approved annual budget for Collinsville Community Unit School District No. 10 is $70,289,38. The annual budget if the proposition is approved and the tax for transportation purposes is levied at the maximum rate would be $72,486,576, an increase of 3.13% over the current budget. Your local basement waterproofing & foundation repair company. Our hearing healthcare experts are dedicated to providing the best patient care for our community. We work closely with each patient’s physician to ensure comprehensive treatment. We will send hearing evaluation results to any physician designated by our patient. Your results belong to you. We will provide a copy of your diagnostic results to you, upon request. Live Local, Care Local. There is no need to go out of town for hearing healthcare. We have four convenient locations and every member of our team is committed to providing the best care possible for every person that walks through our door. We provide comprehensive audiological evaluations, tinnitus evaluations, and individualized treatment plans. We utilize real ear verification measurements to ensure your hearing aids are performing like they should. 3511 College Ave in Alton! No gimmicks, no pressure, and no hidden fees. We want to thank our patients for voting for us to win the Best of the Best in the Riverbend Area. We truly appreciate the opportunity to serve our community. rebaTe rebaTe Details Manufacturer incentives subject to change without notice & may affect dealer’s selling price. everyone qualifies for Cassens price. Tax, title , license & doc fee extra. 0% APR for 75 months rebaTe on selected vehicles. Se dealer for details. Details Manufacturer incentives subject to change without notice & may affect dealer’s selling price. everyone qualifies for Cassens price. Tax, title , license & doc fee extra. 0% APR for 75 months on selected vehicles. Se dealer for details. *Residency restrictions apply. Must take delivery by 11-30-15. Vehicles listed based on inventory. Savings listed for well qualified buyers. Not all buyers will qualify for lowest rate. Must receive financing from Chrysler Capital. See Dealer for rebaTe rebaTeCassensprice. Tax, title , license & doc fee extra. 0% APR for 75 months rebaTe Details Manufacturer incentives subject to change without notice & may affect dealer’s selling price. everyone qualifies for Cassens on selected vehicles. Se dealer for details. Details Manufacturer incentives subject to change without notice & may affect dealer’s selling price. everyone qualifies for Cassens price. Tax, title , license & doc fee extra. 0% APR for 75 months on selected vehicles. Se dealer for details. rebaTe rebaTe Cassens Details Manufacturer incentives subject to change without notice & may affect dealer’s selling price. everyone qualifies for Cassens price. Tax, title , license & doc fee extra. 0% APR for 75 months on selected vehicles. Se dealer for details. turer incentives subject to change without notice & may affect dealer’s selling price. everyone qualifies for Cassens price. Tax, title , license & doc fee extra. 0% APR for 75 months on selected vehicles. Se dealer for details. *Residency restrictions apply. Must take delivery by 11-30-15. Vehicles listed basedrebaTe on inventory. Savings listed for well qualified buyers. Not all buyers will qualify for lowest rate. Must receive financing from Chrysler Capital. See Dealer for Cassens *Residency restrictions apply. Must take delivery by 11-30-15. Vehicles listed basedrebaTe on inventory. Savings listed for well qualified buyers. Not all buyers will qualify for lowest rate. Must receive financing from Chrysler Capital. See Dealer for Cassens Details Manufacturer incentives subject to change without notice & may affect dealer’s selling price. everyone qualifies for Cassens price. Tax, title , license & doc fee extra. 0% APR for 75 months on selected vehicles. Se dealer for details. Details Manufacturer incentives subject to change without notice & may affect dealer’s selling price. everyone qualifies for Cassens price. Tax, title , license & doc fee extra. 0% APR for 75 months on selected vehicles. Se dealer for details. CoNSumer CaSh CoNSumer CaSh *Residency restrictions apply. Must take delivery by 11-30-15. Vehicles listed based on inventory. Savings listed for well qualified buyers. Not all buyers will qualify for lowest rate. Must receive financing from Chrysler Capital. See Dealer for *Residency restrictions apply. Must take delivery by 11-30-15. Vehicles listed based on inventory. Savings listed for well qualified buyers. Not all buyers will qualify for lowest rate. Must receive financing from Chrysler Capital. See Dealer for Cassens Details Manufacturer incentives subject to change without notice & may affect dealer’s selling price. everyone qualifies for Cassens price. Tax, title , license & doc fee extra. 0% APR for 75 months on selected vehicles. Se dealer for details. Details Manufacturer incentives subject to change without notice & may affect dealer’s selling price. everyone qualifies for Cassens price. Tax, title , license & doc fee extra. 0% APR for 75 months on selected vehicles. Se dealer for details. *Residency restrictions apply. Must take delivery by 11-30-15. Vehicles listed based on inventory. Savings listed for well qualified buyers. Not all buyers will qualify for lowest rate. Must receive financing from Chrysler Capital. See Dealer for ctions apply. Must take delivery by 11-30-15. Vehicles listed based on inventory. Savings listed for well qualified buyers. Not all buyers will qualify for lowest rate. Must receive financing from Chrysler Capital. See Dealer for Cassens Details Manufacturer incentives subject to change without notice & may affect dealer’s selling price. everyone qualifies for Cassens price. Tax, title , license & doc fee extra. 0% APR for 75 months on selected vehicles. Se dealer for details. turer incentives subject to change without notice & may affect dealer’s selling price. everyone qualifies for Cassens price. Tax, title , license & doc fee extra. 0% APR for 75 months on selected vehicles. Se dealer for details. Cassens *Residency restrictions apply. Must take delivery by 11-30-15. Vehicles listed based on inventory. Savings listed for well qualified buyers. Not all buyers will qualify for lowest rate. Must receive financing from Chrysler Capital. See Dealer for Cassens *Residency restrictions apply. Must take delivery by 11-30-15. Vehicles listed based on inventory. Savings listed for well qualified buyers. Not all buyers will qualify for lowest rate. Must receive financing from Chrysler Capital. See Dealer for Details Manufacturer incentives subject to change without notice & may affect dealer’s selling price. everyone qualifies for Cassens price. Tax, title , license & doc fee extra. 0% APR for 75 months on selected vehicles. Se dealer for details. Details Manufacturer incentives subject to change without notice & may affect dealer’s selling price. everyone qualifies for Cassens price. Tax, title , license & doc fee extra. 0% APR for 75 months on selected vehicles. Se dealer for details. *Residency restrictions apply. Must take delivery by 11-30-15. Vehicles listed based on inventory. Savings listed forCassens well qualified buyers. Not all buyers will qualify for lowest rate. Must receive financing from Chrysler Capital. See Dealer for *Residency restrictions apply. Must take delivery by 11-30-15. Vehicles listed based on inventory. Savings listed forCassens well qualified buyers. Not all buyers will qualify for lowest rate. Must receive financing from Chrysler Capital. See Dealer for Details Manufacturer incentives subject to change without notice & may affect dealer’s selling price. everyone qualifies for Cassens price. Tax, title , license & doc fee extra. 0% APR for 75 months on selected vehicles. Se dealer for details. Details Manufacturer incentives subject to change without notice & may affect dealer’s selling price. everyone qualifies for Cassens price. Tax, title , license & doc fee extra. 0% APR for 75 months on selected vehicles. Se dealer for details. *Residency restrictions apply. Must take delivery by 11-30-15. Vehicles listed based on inventory. Savings listed for well qualified buyers. Not all buyers will qualify for lowest rate. Must receive financing from Chrysler Capital. See Dealer for *Residency restrictions apply. Must take delivery by 11-30-15. Vehicles listed based on inventory. Savings listed for well qualified buyers. Not all buyers will qualify for lowest rate. Must receive financing from Chrysler Capital. See Dealer for Cassens Details Manufacturer incentives subject to change without notice & may affect dealer’s selling price. everyone qualifies for Cassens price. Tax, title , license & doc fee extra. 0% APR for 75 months on selected vehicles. Se dealer for details. Details Manufacturer incentives subject to change without notice & may affect dealer’s selling price. everyone qualifies for Cassens price. Tax, title , license & doc fee extra. 0% APR for 75 months on selected vehicles. Se dealer for details. Cassens Details Manufacturer incentives subject to change without notice & may affectlisted dealer’s selling price.well everyonequalified qualifies for Cassensbuyers. price. Tax, title ,Not license &all doc fee extra. 0% APRwill for 75 months on selected Se dealer for details. Must by 11-30-15. listed based inventory. Savings for buyers qualify forvehicles. lowest rate. turer incentives subject *Residency to change without notice &restrictions may affect dealer’s sellingapply. price. everyone qualifiestake for Cassensdelivery price. Tax, title , license & doc fee extra. 0% APRVehicles for 75 months on selected vehicles. Se dealer on for details. Everyone qualifies for Cassens prices. Tax, Title, License and Docs extra.